The cliché is that Rocky is a mumbler, a dope with a limited vocabulary (“Yo! Adrian!”), but here, in the first movie, it’s quite the opposite. He’s tirelessly motormouthed, a prolific bullshitter. Perhaps because he’s spent his life around promoters, other boxers, and, most notably, the loan shark Gazzo – the main authority figure in Rocky’s life, and a man who himself desperately wants to prove how kindhearted he is, as if to counterbalance his thuggery – Rocky can’t stop promoting himself. He wants to be liked. He needs to be liked. But watch how Stallone (both as a writer and an actor) chooses when to let Rocky ramble and when to have him shut up. The formula is a simple one: the more power Rocky has (or perceives to have) over someone, the more he talks; the more power someone has over Rocky, the quieter Rocky becomes. We get hints of this in his interactions with Gazzo, where he’s chatty but also a bit reserved, at least when compared to his talks with Paulie, the fellow fast-talkers hanging outside the gym, or, most obviously, Marie. He may not have literal power over her, but he envisions himself a role model and respected neighborhood figure, much like his view of Gazzo. And so he talks, and talk, and talks. More hints come in his interactions with Mick (introduced as an antagonist with just enough authority to get under Rocky’s skin) and Adrian (whose power over Rocky grows the more he reveals his secrets to her; the more integral she becomes to his life, the less he feels it necessary to charm her, the less chatty he becomes). But this formula is never made totally clear until he sits down with Jergens, the promoter. Initially assuming Jergens wants him to spar with Apollo Creed in training, Rocky is still in self-promotion mode, albeit a shy version of it. He wants the job but is afraid of speaking too much. He’s likely never been around such a big name. It’s almost as if he’s ashamed; he considers himself a nobody, and what business does a bum like him have in this office? The only character with more authority over Rocky than Jergens is the champ himself. 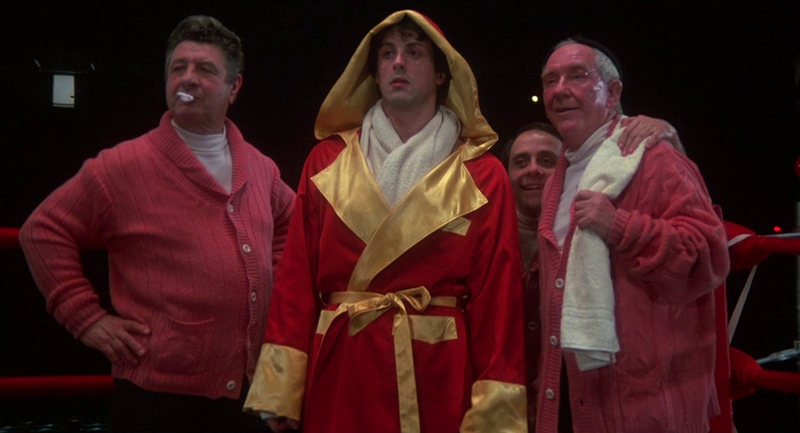 Outside of the ring, Rocky says nothing to Creed at all. He mumbles a few sentences to reporters during the press conference – including one calling Apollo “the best” – but for all of Creed’s showboating before the match, Rocky doesn’t say a word back to him. The champ has the ultimate power… until, that is, the middle of the fight, when Rocky proves himself to himself through endurance. Now, after realizing he “weren’t just another bum from the neighborhood” after all, he’s comfortable egging on the champ, ordering his opponent to keep the fight going. After the fight, Rocky treats Apollo almost as an equal, not shying away from telling him directly he doesn’t want a rematch.